Glaucoma is damage to the main nerve of the eye (optic nerve) by the pressure within the eye. The pressure is usually elevated above normal but up to 25% of people with glaucoma will not have elevated pressure in their eye. Glaucoma can be dangerous to your eyesight and is a leading cause of blindness in those 60 years and older. Estimates show that at least 3 million people in America have the disease and don’t even know it. However, with early detection and treatment, blindness and loss of vision can usually be prevented. The eye makes fluid (aquaeus humor) to give nourishment to parts of the eye without blood supply (cornea and lens). This fluid is leaving the eye through meshworks that put the fluid back into circulation. In glaucoma, these meshworks can become “clogged” or lead to increased resistance for fluid leaving the eye. This can result in a higher eye pressure in the eye, which can cause nerve damage or glaucoma. Other people can develop Glaucoma without pressure rise and some people with elevated pressure never develop glaucoma. The nerve damage, and the detection of that, are done by additional testing beyond a comprehensive eye exam. Usually there are no symptoms from glaucoma until very late in the condition. 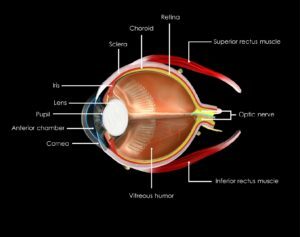 The cause of Glaucoma is usually genetic or inherited. Under certain circumstances and when other eye conditions are present, Glaucoma may also develop. Unfortunately, in the early stages, you often don’t have any Glaucoma symptoms or signs of the disease. These glaucoma symptoms manifest themselves at a later time, after some of your vision has been damaged. Early detection and treatment is the key to maintaining your eyesight. Learn more about Glaucoma treatment options. If you have not been checked for Glaucoma and want to schedule an appointment to be tested, you can call our office at 281-890-1784 or contact us online. Our ophthalmologists at 1960 Eye Surgeons are board certified with 30 years of experience treating Glaucoma and recognizing the symptoms of Glaucoma, and our optometrists are trained glaucoma specialists. Their diagnosis and treatments have lead to better outcomes for their patients. See what patients are saying about their treatment of Glaucoma.